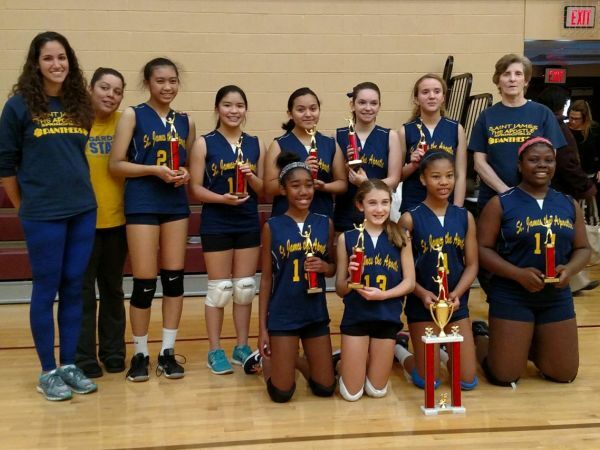 CYO volleyball is a FAll sport at Saint James. Girls in fifth through eighth grade from both the school and parish are invited to try out for the team. The number of teams is determined by the number of girls wishing to play this exciting sport. After try outs, each girl is assigned to either a junior varsity or varsity team. Practices take place on Mondays and Wednesdays after school from early September to mid-November. During practices the girls have the opportunity to practice their skills and take part in game simulations. Games are played at Roselle Catholic on Saturday and Sunday against other elementary schools in the Archdiocese of Newark. Each year approximately 12 schools are represented. Our teams have been very successful over the years and the girls' skill levels have continued to develop. We are happy to announce that any girl who wished to play on the high school level has done so. Several have gone on to play at the college level. GO PANTHERS! GO BLUE AND GOLD !